Ashes to ashes, dust to dust. Religion teaches us to expect certain things from life and death and offers us customs for both. Yet, sometimes people innovate, and not always for the better. 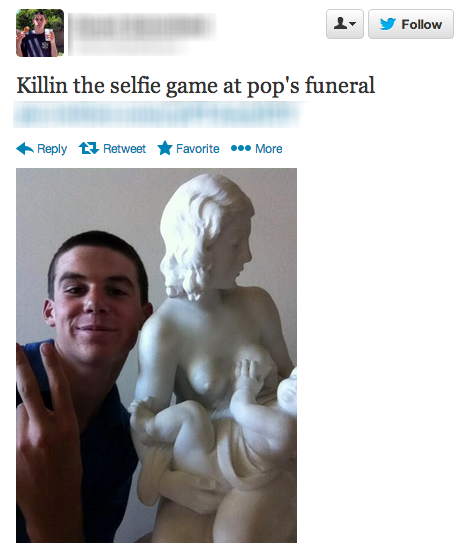 Case in point: funeral selfies. According to Clive Thompson, the author of the new book Smarter Than You Think: How Technology Is Changing Our Minds for the Better, “Taking a photograph is a way of trying to understand how people see you, who you are and what you look like, and there’s nothing wrong with that”. Sure, there’s nothing wrong with taking and posting countless photos – I myself snap countless pictures of my exuberant toddler – but this recent trend signals we have reached the point of photographic absurdity. Funeral selfies may represent a new societal nadir. Teenagers are leading the way with this trend, which is best described as disturbing. I remember my own grandmother’s funeral. I was an 18-year old college freshman, and although my Grandma was elderly, her death was still an unwelcome blow. I flew home to join my family in New York for the funeral and shiva. Friends and neighbors visited my parents’ house, listening to stories about my grandmother and bringing food, eliminating our need to shop or cook. When I returned to my dorm still feeling emotionally raw, I found condolence cards from classmates tucked under my door. I missed my grandmother, but I felt comforted by Judaism’s detailed mourning rituals – the prayers, the food, and especially the community. Everything happened off-line, in part because no one had smart phones yet, but mostly because mourning is a painful, personal experience. It’s not something I’d want to share with thousands of my closest acquaintances. Everyone copes with grief differently, so there should be some leeway when observing other people’s reactions to death. However, posting your reaction online invites comment, especially about propriety, or the lack thereof. For digital natives, there is apparently no physical or emotional space that’s off limits to their smart phones. As a writer, I regularly write about my life, including difficult things that happen, but there are limits to what I’m willing to share publicly. Painful situations, especially if they involve other people, are typically verboten. So I can’t imagine mourning the loss of a close friend or family member in full view of the general public, or at least anyone curious enough to click on my picture. Interestingly, the photos on the Selfies at Funerals Tumblr aren’t somber. The subjects generally don’t look happy, but most of the photos aren’t particularly serious or reverent. Some are outright inappropriate, like the kid smirking and flashing a peace sign while posing with the statue of the buxom nursing mother. There may be nothing more gauche. The existence of these photos, along with the Web site, raises several questions: Why do the subjects feel compelled to take these photos? Why are they sharing them publicly? Do their parents know about these photos? And do their parents consider this an acceptable coping mechanism, or are they offended by them? James Hamblin, The Atlantic’s Health editor wrote, “This is the generation of impersonal intimacy and achingly self-conscious expression. Sometimes there’s more to it than vanity, I think.” That sounds fair. If these photos were a matter of vanity, they would all be glamour shots. But what does it say that these teenagers process their grief so impersonally? It highlights the absence of any personal boundaries, which would allow them space to mourn in earnest. That’s a shame for them, because such boundaries would be healthy. There’s something incredibly strange, and even sad, about this whole trend. Rather than rely on age-old mourning rituals and community to help them through a difficult time, these teens are developing their own tradition, which looks remarkably unsatisfying. The global reach of the Internet is powerful and often beneficial, but there are certain things, like grieving, that are still done better locally. After all, when the chips are down, it’s the people who truly know you – and not your online persona – who are likely to be there for you with a kind word or a kugel.